It's kind of surprising to hear Mike Mulgrew take up the mantra of those who've opposed UFT enabling of corporate reform, but he's absolutely correct that we're the real reformers. Pictured at left are a group of independent activist unionists, regularly excoriated by the elite invitation-only Unity Caucus. They predate Mulgrew's assertion by several years, are wearing real reformer capes and protesting a corporate reform event. Yes, we are the real reformers, and yes we do whatever we have to in order to help the kids we see every day. Sadly, placing guns to our heads helps neither us nor them, and that's why the fear tactics Mulgrew uses to sell the substandard contract he negotiated are such bad ideas. Mulgrew condemns the strategy of closing schools, but was part of the UFT leadership that endorsed mayoral control. When it became abundantly clear that school closing was the favored strategy of Tweed, UFT asked for a few changes, failed to get them, and supported mayoral control again anyway. Of course mayoral control's been seriously compromised now that Bill de Blasio tried to use it to slow down Eva Moskowitz. Governor Cuomo feels mayoral control should apply only to mayors who use it in support of Moskowitz, the legislature agrees, and Mulgrew's UFT leadership lifted not a finger to stop them from enabling her. Mulgrew boasts of UFT lawsuits, and in fact used them when running against Jamaica Chapter Leader James Eterno for UFT President. Despite his words, UFT abandoned Jamaica High School, now set to be closed under the administration of the most progressive mayor in decades. The closure of Jamaica High School, among many others, epitomizes the failure of UFT leadership. It's unconscionable that Eterno himself, for my money the city's best chapter leader, will likely become an ATR subject to second tier due process. Union means we are one, not that some are less equal than others. Our president bemoans the same charters his leadership failed to oppose with Bill de Blasio. 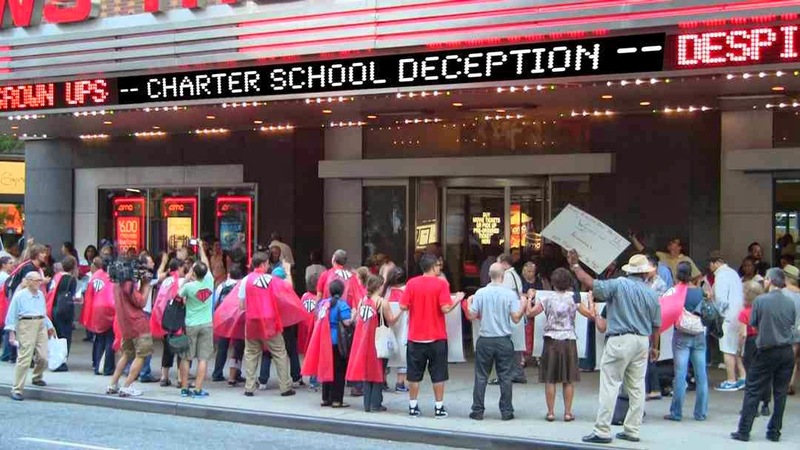 But the UFT has a long history of failure regarding charters. UFT has not only supported charters, but has further partnered up with anti-teacher Steve Barr. Barr not only fired most of the LA teachers he bamboozled with pizza before failing to improve the school, but eventually championed the parent trigger movement. Mulgrew's UFT leadership partnered with Barr to bring a Green Dot school to NYC. Not only that, but the UFT started its own charter school and colocated it. The Post delights in writing about its poor performance. It's remarkable that Mulgrew can now criticize charters with no irony whatsoever. Mulgrew now criticizes using value-added to rate teachers, but when NY's evaluation law was created, he boasted of his input in it. It was the best thing since sliced bread. We finally had multiple measures, he said. The best thing, of course, was that we could negotiate precisely how junk science would be used to fire us. Of course that never happened, and this was Bloomberg's fault. It had to be, of course, since nothing is ever the fault of UFT leadership. Nonetheless, when agreement could not be reached with the fanatical ideologue for whom we'd endorsed mayoral control, we happily appointed yet another fanatical ideologue, NY Education Commissioner John King, as an impartial mediator. It's terrible, says Mulgrew, that the city backtracked on its promise not to release junk science scores to the media. He's right, of course. What he forgets is that we already knew Tweed was unworthy of our trust when we agreed to pilot the junk science scores. Also, if we're so opposed to using junk science, why on earth did we agree to fool with it in the first place? Master teachers I know, and I have a few in mind, help their colleagues as a matter of course. They don't need an extra 20K to do so, and if they did they wouldn't be master teachers. This is not the first time the UFT has agreed to enact merit pay they claimed wasn't merit pay. The last time it was a miserable failure. I've got no reason to believe it won't be this time either. Every time we jump because the corporate reformers claim we need remedies for plagues that don't exist, we move just one step backwards. Though many teachers already feel backed against a wall, UFT keeps allowing us to be pushed. I won't even bother to discuss the money we may get, if we don't quit or die, six years from now, a decade after most of our unionist brothers and sisters got theirs. Mulgrew also praises professional development. This, Mulgrew concludes, will benefit our students. It's been a few years since Mulgrew has been in the classroom, but his experience with PD must be an awful lot better than mine. Mine suggests the overwhelming majority of PD is a waste of time. I fail to see what's been done to improve this, but clearly history plays little part in the decision making processes of the loyalty oath-signing Unity Caucus, the aristocratic clique that rules our union via patronage, threats, and logical fallacies that keep most working teachers cynical and demoralized. That's too bad, because cynicism and demoralization helps neither us nor our kids, and I don't want our kids treated remotely the way UFT leadership treats us.